View of “The Semi Aware Subject,” 2013. 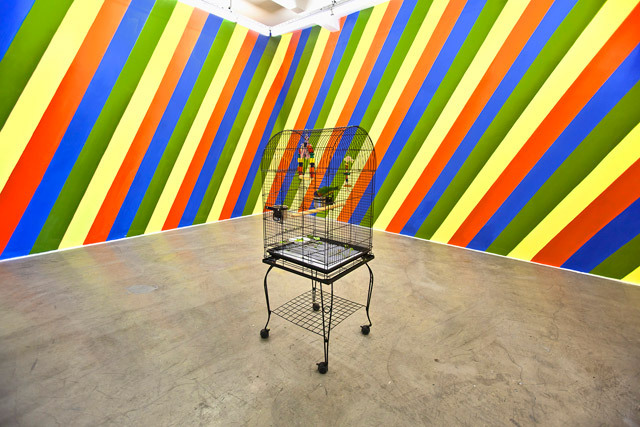 Erdem Taşdelen, Don’t Say I Didn’t Say So, 2013, lorikeet, birdcage, wall paint, dimensions variable. Photo by Serkan Tunç. Mehtap Öztürk: Erdem, I’d like to start with a question about your recent exhibition at Galeri NON. The title of your exhibition is “The Semi-Aware Subject” and as it is written in the press release, the exhibition revolves around the idea of the production and performance of different subjectivities. 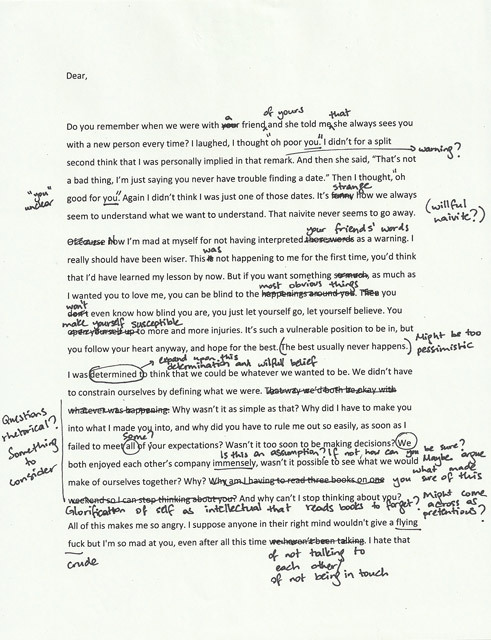 Post-structuralists often look at the subject by deconstructing it to parts in order to scrutinize it objectively and create a total self-awareness. How do you position yourself as an artist within this discussion? Erdem Taşdelen: The framework within which I position my work is influenced by cultural theory, both because a large part of my formal education heavily emphasized the role of research and because I teach cultural theory to undergraduate students. I think there is opportunity in viewing individual works of mine to focus on various other things, but the one persisting question in all of what I do is: how do we think about the notion of the subject after post-structuralism, when it is commonly understood that our subjectivities are produced by the social world around us and everything can be read as a performance? I think this question is especially pertinent given that contemporary art often looks at the idea of self-expression with disdain and cynicism. What, then, is the responsibility of an artist who contributes to cultural production by drawing upon his/her own singular experiences? I don’t think this is a question to be taken lightly and I can’t claim to have an answer, but I’m experimenting with performing my various selves in public with my work and seeing how much individuals can relate to it, particularly those who may not be well-versed in art history. MÖ: For your work titled Erdem Taşdelen, you created 48 different business cards by inscribing various attributions and identifications like “delusional lover” or “dissatisfied libertine” and again in Dear, you used unsigned love letters where we don’t know the addressee, though we assume that the unsigned letters belong to you. Do you appear as a “subject” or a “character” in your works? And do you think making your presence palpable in your works might reduce your discussion to your story? ET: I think your question alludes to the tense relationship between fact and fiction when one presents oneself in a work of art, be it in literature, cinema or contemporary art. The works that you’ve mentioned come from a factual place, but for the audience there is no guarantee that they do. I think that they inevitably have to see the self I present as a fictitious self because I don’t promise to be truthful. Yes, when I wrote the letters in Dear, I was in fact hopelessly in love, but I don’t think this should matter since the work is not about me as a person but about an experience that many of us go through. This is where cheekiness may come in, and I am also finding new ways to experiment with this. With the doormat series Enchantments for instance, I am presenting an alternate version of myself who has superstitious beliefs, although I don’t really in reality. And in Worrier, I am talking about my real worries in therapy sessions, but the presence of the cameras necessarily results in me concealing certain things and highlighting others. I am very much aware of the danger of having the work reduced to my story, and I wouldn’t want that at all. In that sense I feel more of an affinity with artists like Simon Fujiwara and Alejandro Cesarco than Tracey Emin and Joseph Beuys. Erdem Taşdelen, Dear, 2010. Inkjet and ink on copy paper (24 letters, 47 pages), 21 x 28 cm each, total installation size: 450 x 110 cm. MÖ: Can you open up this comparison? Fujiwara and Cesarco use their personal history to create a narration in their works where reality and fiction blur. What are your thoughts on that? Most of your work takes inspiration from your personal experiences, so how do you incorporate “you” into “your art”? ET: Well, the reason I pit Cesarco and Fujiwara against Emin and Beuys is because of the difference in their approaches to personal reflection. I think that even though Cesarco and Fujiwara draw from their own personal histories, that fact is not the primary lens through which we must read their work. Both Emin and Beuys play up the myth of celebrity in how they present themselves, so it’s hard to detach the creator from the work itself. There seems to be a glorification of the figure of the artist, where the artist seems to be given more importance than the audience. This is perhaps more immediately apparent in Emin’s work, because Beuys argued that everyone can be an artist and that he should not be seen as an authoritative figure. However he did indeed make himself into an authorial figure, so there’s an underlying contradiction there. This is not what I want to do with my work; I don’t want the audience to think that I’m a special person whose story deserves more attention than theirs. I think it’s much more interesting to find a common ground between the maker and the viewer and to not glorify or romanticize the self too much. The space that opens up between the artist and the audience through the work is where the blurring of reality and fiction occurs, and I find that to be more fruitful in thinking about the notion of the self. When I look at my own work I find that I am actually able to distance myself from it; I don’t necessarily feel like I’m baring my soul, and I think that’s precisely because of the process of turning something personal into an exploration of shared experiences. 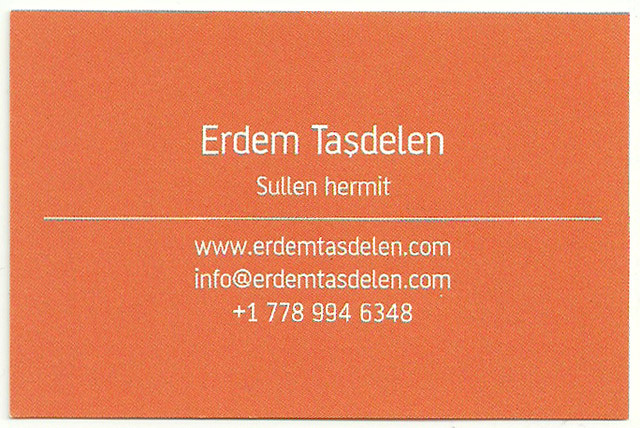 Erdem Taşdelen, You You You, 2012. 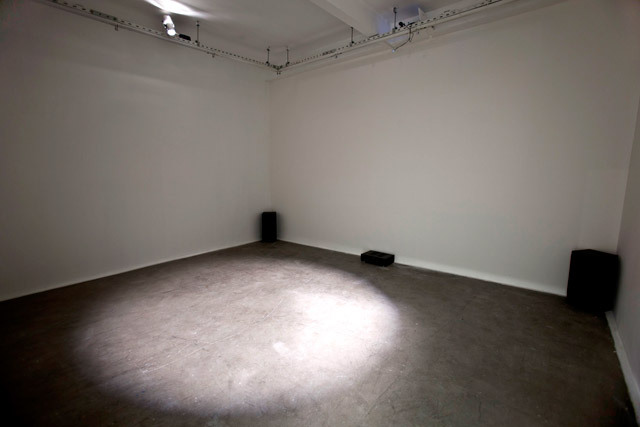 Interactive sound installation with webcam-operated motion detector, spot lights and speakers, 6′ 51″, dimensions variable. Photo by Serkan Tunç. MÖ: Your You You You installation composed of every utterance of the word “you” in Kylie Minogue’s discography in chronological order and activated by the motion of the audience itself, is the only work within the exhibition that is directly addressed to the audience. Though pertaining to popular culture, separating the common denominator from its contexts, you achieve the dissociation of the self from the generic “you”s. Comparing to your other works do you think that you change your position as the artist by making the viewer the subject of the work itself? ET: It’s possible to see it that way because the utmost genericness of the word “you” is directed towards the viewer in a clear way, but I don’t know if I would agree that this work does what you say more than other works. One could even say that this genericness might hinder the audience from associating with the work at all, because it’s so vague. The intensity of what is explored in Dear, or Worrier might be a lot more relatable for many people. It’s difficult to say in advance who would become the subject of a work but perhaps You You You mocks that idea itself. You walk into the spotlights and there is this loud pop music calling for you, but you know that that’s only illusory, which is also a bit sad, isn’t it? View of “Envy, Enmity, Embarrassment,” 2013. Erdem Taşdelen, Worrier, 2012. 5 channel video installation. Photo by Cem Turgay. MÖ: Self-reflection, disclosure, and ridicule are the ways that you discuss the production and performance of subjectivity. 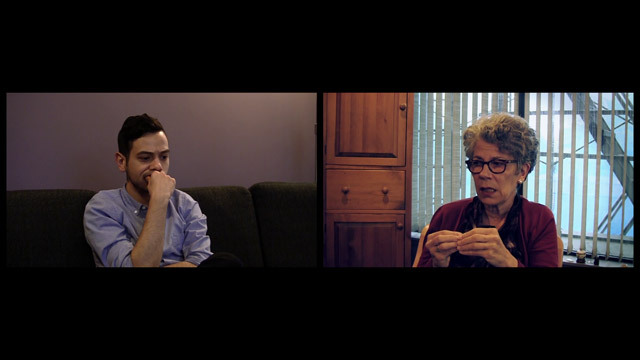 In your recent 5 channel video installation Worrier that is right now being shown in “Envy, Enmity, Embarassment” at ARTER, we see you in therapy sessions where you are questioning your fears about being an emerging artist. Worrier as well as your other works Erdem Taşdelen and Dear, where self-interrogation is apparent call sincerity into question. Could you elaborate more on your ideas about self-reflexivity and sincerity especially in Worrier, which is indeed a documentation of therapy sessions under the presence of a ‘video recorder’? ET: It’s funny that you ask that because the first reaction I get from people I talk to about Worrier is the question of whether it’s real therapy or not. I am completely sincere about the worries I present in Worrier, but I can’t answer the question properly because I don’t know if therapy under surveillance is indeed “real” therapy. It was definitely therapeutic for me and I got a lot out of it, so I’m inclined to say it was pretty real. However of course there were many things I wasn’t willing to talk about on camera, so those things never became part of the conversation. I think that what I’m doing in my work is to make public something that we all experience in different contexts. Can you say that you’re always completely sincere when you talk to people? What is the meaning of sincerity? To be fully oneself without any pretensions? That itself assumes that there is a real self under the many social layers that we put on, which is not a notion I believe in anyway. We’re always performing our many selves, even with those we deem closest to us. I think I’d like to point to that tension and just put it out there. When I call myself a drama queen on a business card and I hand out that card to strangers, how much of that is sincere and how much of it is ironic? I can’t even answer that myself. Erdem Taşdelen, Worrier, 2012. 5 channel video installation. MÖ: And finally Erdem Taşdelen and Worrier are not only about self-reflection but also about being an artist or more specifically being an emerging artist. Could you open up “the figure of the contemporary artist” a little bit more? ET: The reason I use that phrase is because of the social connotations that the descriptor “emerging artist” brings about. I don’t claim to present this as an objective fact but in my experience there are certain expectations from emerging artists, a certain way that you have to wear that subjectivity and present it with a degree of certainty and confidence. I have spent the past couple of years worrying about whether I’m failing at that or not. Do I sound stupid in studio visits? Does my work come together coherently? Do I look too insecure? Is it OK if I don’t want to associate with that person because I just don’t like them? And so on and so forth… So I decided to make those worries public and perhaps mess with that game a little bit. I’ve heard reactions from other artists where they said they thought I was crazy for making myself so vulnerable at the beginning of my career, but I feel better about admitting to these things than trying to act like I’ve arrived at the destination before I’ve made the journey. Erdem Taşdelen, Enchantments, 2012. 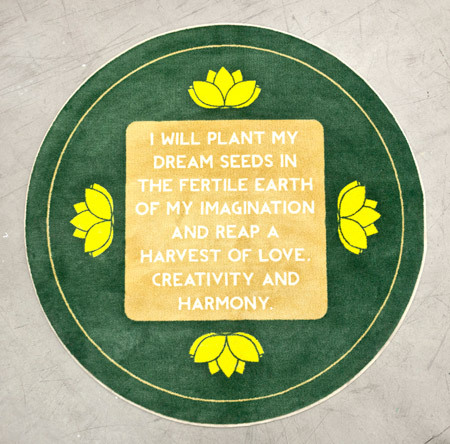 Carpeted door mat, 120 cm in diameter. Photo by Serkan Tunç. Mehtap Öztürk is an art professional based in Istanbul. Posted in content, on artists and tagged Arter, Dear, Don't Say I Didn't Say So, Enchantments, Erdem Taşdelen, Gallery NON, Mehtap Öztürk, The Semi Aware Subject, Worrier, You you you. Bookmark the permalink.